Hello Thurdsay! Seems like we were just here doesn’t it? Where is the time going? Thank you so much to all of you who shared your amazing talents here last week! You did not disappoint! It was so hard to choose just a handful to feature but these are the ones that caught my eye this week. 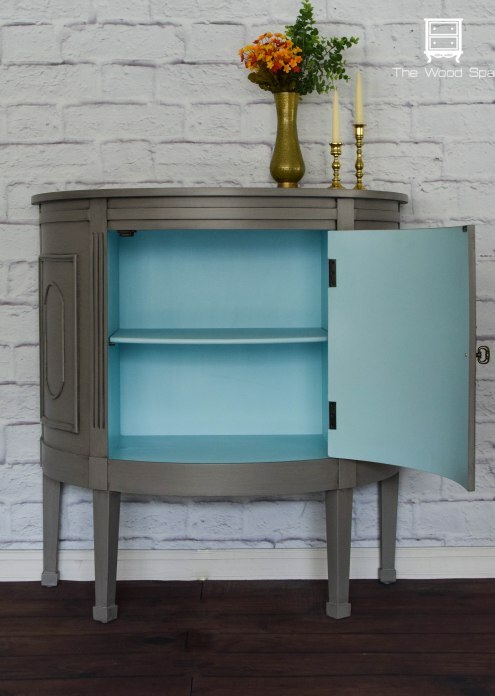 Patricia from The Wood Spa has been rocking out the most beautiful finishes and she has done it again with this sweet turquoise and gray cabinet! It looks high end Patricia! Well done! Now I know I featured this talent last week but I couldn’t help but share her work again! I swear I’m not playing favorites! 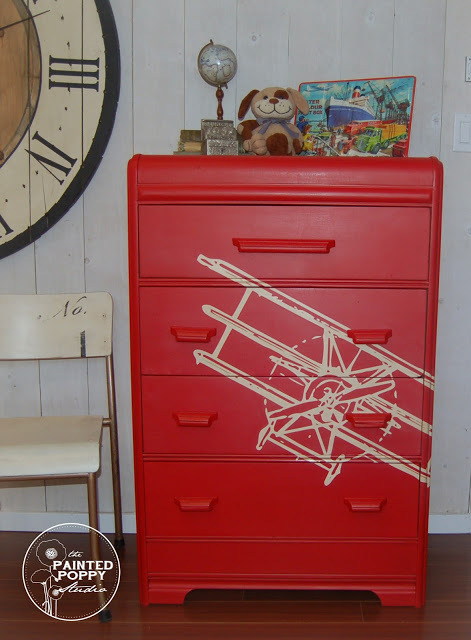 Kim from The Painted Poppy Studio took this drab, sad little waterfall dresser and turned it into the Red Baron hero! What a fun makeover for this piece! I love her vision for it and she executed it so well! 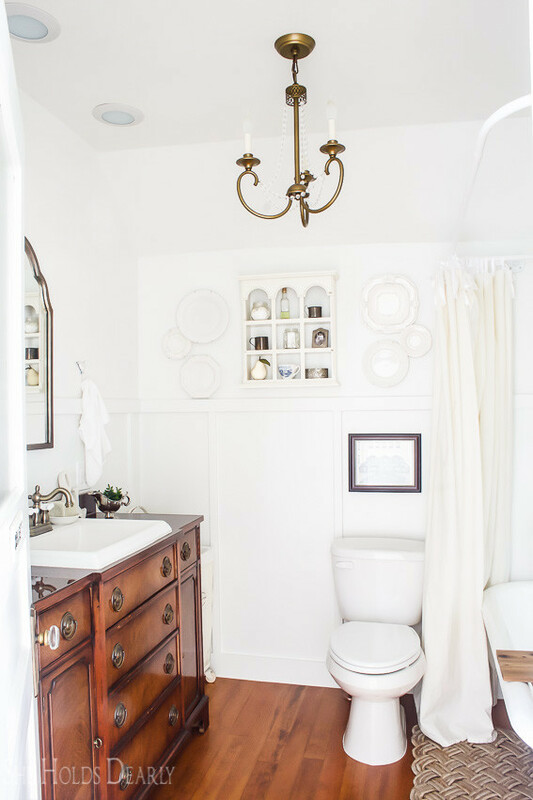 Lastly, I couldn’t help but share this insanely gorgeous bathroom makeover by Sarah from She Holds Dearly. She has created the most calming and beautiful space and you can see the careful consideration she put into every last detail of it. You must go check out the gorgeous pictures! I had so much fun visiting all those who linked up last week! I hope you enjoy this party as much as I do! So happy to have you join in every Thursday, it’s a pleasure to host your creativity and talents! Thank you for the inspiration you bring here each week! Thanks for the party, Terry. Have a good day. Thank you for stopping by Mary, I Love your Diamond Point inspiration! I hope you have a great weekend! Oh my goodness, I’m in such good company. Love every one of your picks! Thanks so much for including me. So many lovely pieces to choose from Quandie! Thank you so much for joining in and sharing your work! I hope you have a great weekend! 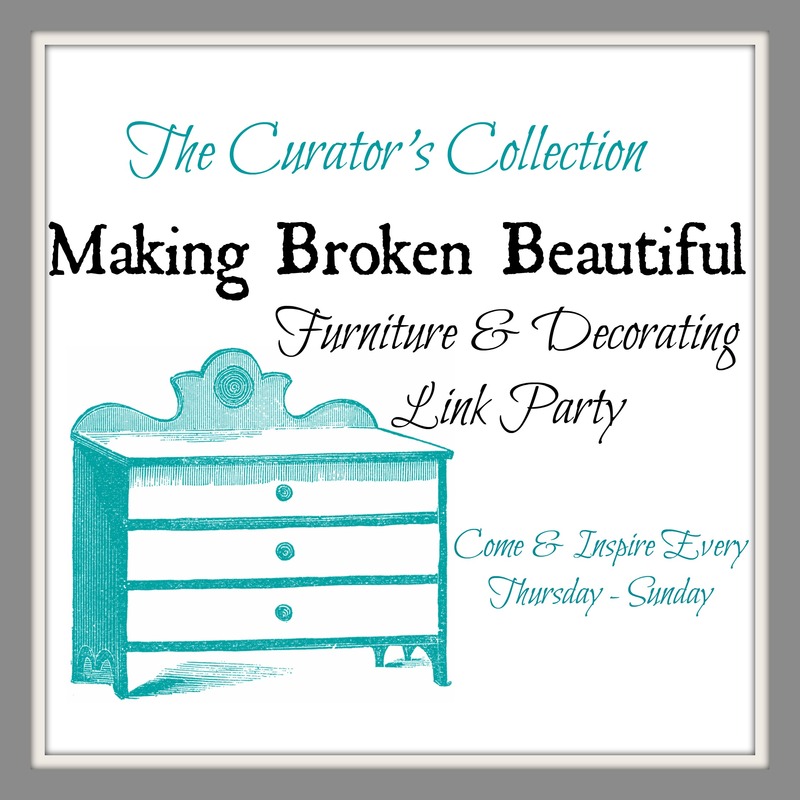 Thanks for featuring my cabinet!! My jaw dropped when I saw that red waterfall chest. What a beauty. Love all your choices for this week. This place is pure inspiration! You are so welcome Patricia! Keep on inspiring! Have a great weekend! Thanks so much for the party and the inspiration, Terry!! Enjoy the rest of the week! You are always welcome Pili! I hope you have a great weekend! 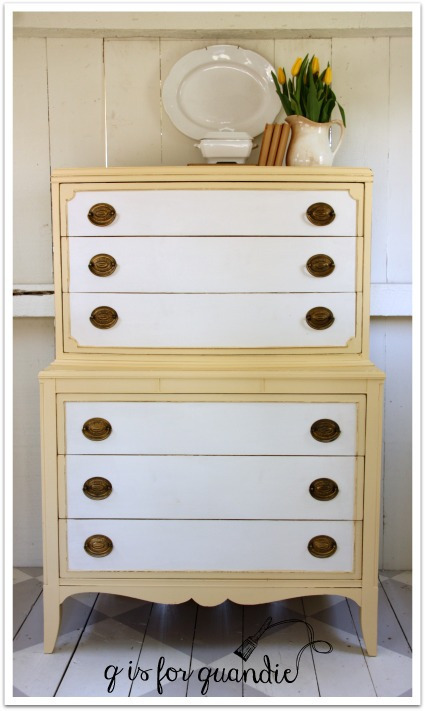 I bought the yellow/white dresser and I love it. Getting it into my apartment on the 6th floor was difficult because the piece is very heavy. We got it stuck in the doorway/entry to the building.. My sister says “Where is a strong man when you need one” A grey car pulled up to the door and a very strong nice looking man asked if we needed help. He was a gift from God! Oh My Goodness you are lucky to have this beautiful piece! I’m so happy you were able to get it in your home after all that struggle! Random acts of kindness are the best! I hope you enjoy your new dresser! Have a wonderful day! I hope you pop by here again! Once again, I am blown away by your generous words and feature! Thank you so much for sharing our master bathroom. You are such an encouragement to me! You are so welcome Sarah! 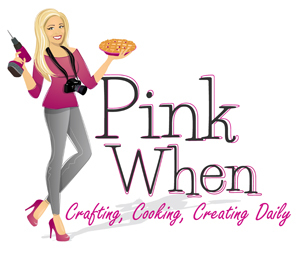 Your eye for design blows me away and I’m honored you share it here! Thank you for inspiring! have a great weekend! Oh Cynthia! You are sweet! Thank you so much for your kind comments all the time! Your work is always welcome here! Thank you for inspiring! Have a great weekend! Great line up Terry… for some reason I haven’t been receiving your notifications via email… but not to worry I have subscribed again! Thank you Maxine! I have been trouble seeing some of my favs too in my news feed. Thank you for re subscribing! I hope you have a great weekend! Wow! 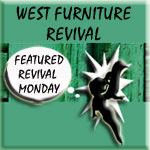 Great features this week; I especially love the red waterfall airplane chest. Thanks for hosting this party. It’s such a relief to sit down and enjoy the creativity that you share. Thank you so very much for taking the time to comment and I hope you enjoyed the party! I’m sorry for the late reply, I don’t know how this comment got lost! I hope you are having an amazing week so far!